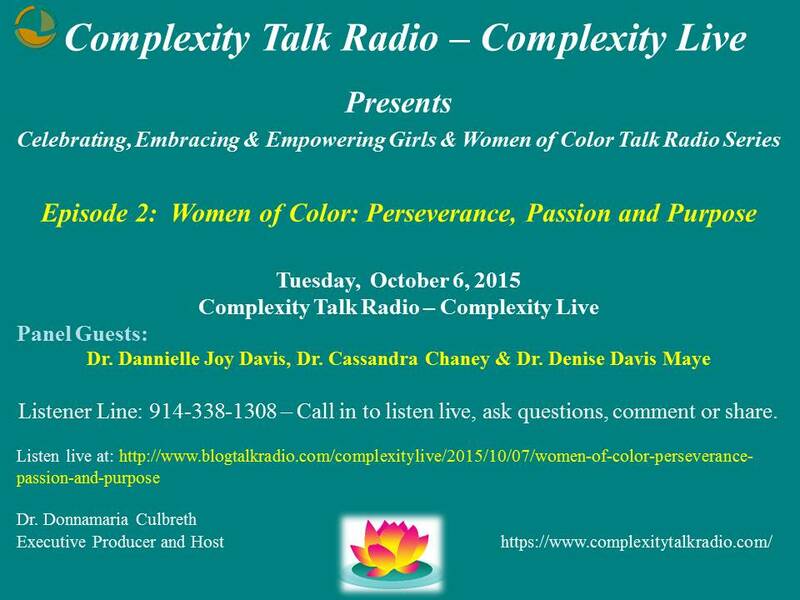 Join Dr. Culbreth, Dr. Dannielle Joy Davis, Dr. Cassandra Chaney and Dr. Denise Davis Maye for Episode 2, Women of Color: Perseverance, Passion and Purpose. Listener Line: 914-338-1308 Call in to listen live, ask questions, comment or share. Yes, life happens and along with it comes the inconvenient issues, moments, or situations that can sometimes upset your balance. Learn to persevere, rediscover your passion, purpose and live with a renewed vision as you continue on your journey. Dr. Dannielle Joy Davis is an Associate Professor of Higher Education at Saint Louis University. A graduate of the University of Illinois at Urbana-Champaign, she has studied and conducted research in Ghana, South Africa, Senegal, Egypt, Germany, the Netherlands, and Belgium. Her interdisciplinary research examines the experiences of marginalized groups in educational settings, the role of organizational policy and practice in the promotion or inhibition of egalitarian academic and occupational outcomes, and spirituality in the workplace and other learning environments. She has published over 40 refereed journal articles, book chapters, academic commentaries, volumes, and reviews. She is Co-editor of the books Black Women in Leadership: Their Historical and Contemporary Contributions (Peter Lang Publishing), Social Justice Issues and Race in the College Classroom: Learning from Different Voices (Emerald Group Publishing Ltd.), and Intersectionality in Education Research (Stylus Publishing). Dr. Davis has served as an Associate Editor for Learning for Democracy: An International Journal of Thought and Practice, The International Journal of Religion and Spirituality in Society, and serves on the Editorial Review Board for the Journal of Colorism Studies. Dr. Denise Davis-Maye, a licensed clinical social worker, is a native New York and transplant to Alabama – where she lives in the county where her paternal family has lived for 4 generations. She is currently an Associate Professor in the Department of Sociology at Auburn University Montgomery. With over 21 years of experience in Social Work practice, Dr. Davis-Maye is an alumna of Clark Atlanta University. She completed graduate work at Hunter College of the City University of New York, and the University of Alabama. She has studied reproductive health issues of adolescents and the psychosocial development of African-American children. Her research interests include the cultural, community and familial impact on the emotional development of adolescent girls of African descent, health disparities and their influence on the well-being of women and girls of color. She conducts training on managing parental roles amidst multiple challenges and the management of emotional and physical health among African American women. Dr. Davis-Maye is a regular presenter at national and international conferences. She has published in the Journal of Children and Poverty, Affilia: The Journal of Women and Social Work, the Journal of Human Behavior in the Social Environment, the Journal of HIV/AIDS & Social Services and the Journal of Social Work Education. Her co-edited book, What My Momma Gave Me: Conceptualizations of Womanhood was published in the Fall of 2013 and she is the co-host of The Mommy Chronicles on Blogtalk Radio. Dr. Cassandra Chaney is an Associate Professor in Child and Family Studies at Louisiana State University (LSU). Dr. Chaney is broadly interested in the dynamics of African-American family life, yet under this umbrella her interests are focused on two main areas. Her primary research focuses on the narratives of African-Americans in dating, cohabiting, and married relationships, with a particular interest in relationship formation, maintenance, and stability. Dr. Chaney has published several sole and first-authored manuscripts in a variety of journals in the United States and abroad. She has also been invited to contribute chapters for several books relating to the topics of African American community sentiment regarding marriage, marriage promotion, strong Black marriages, and the racial experiences of Black professors at Predominantly White Institutions (PWIs). She recently published the co-edited the book Black Women in Leadership: Their Historical and Contemporary Contributions with Dr. Dannielle Joy Davis (Peter Lang Publishers) which explores the leadership experiences of Black women within macro level (such as education, industry, and social services) and micro level (such as family and individual churches) contexts. This interdisciplinary work examines leadership practices, highlighting the historical and current triumphs and barriers of Black women in these roles.